Professor of chemistry and ORNL distinguished scientist introduced his plans to use polymer chemistry to create needed products for the consumer market. Dr. Jimmy Mays, a Professor of Chemistry and ORNL Distinguished Scientist, is making big changes in the world of polymers. He is stretching, quite literally, the applications of polymers in industry, science and society. 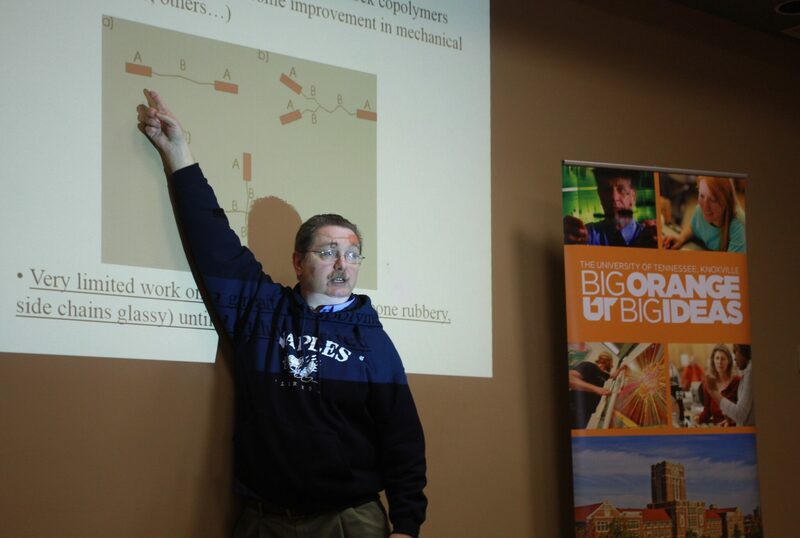 Friday, at the first installment of the UT Science Forum, Mays explained the importance of polymers and how he plans to use them to improve certain aspects of everyday life. By altering the composition of polymers, Mays is able to produce what he calls “super polymers.” These polymers will be able to stretch further and withstand more force before breaking, essentially allowing for the production of better products. His work has drawn international attention and he recently received a grant from the Bill & Melinda Gates foundation to develop cheaper, user-friendlier condoms to prevent the spread of disease and limit pregnancies. When he heard the call from the Gates Foundation to develop a new generation of condoms he was intrigued. From the beginning, Mays has been interested in the production of condoms because it is a big market. With this technology he envisions other products like extra-thin surgical gloves. “If you can make a surgical glove thinner, what is that worth in the operating room?” Mays asked, insinuating the prospect of more successful operations with thinner gloves. Mays is currently using super polymers to develop water filtration systems. They may be used to meet growing demand for clean waters supplies. Companies have recently shown interest in using the technology for less invasive hernia repair. He envisions several applications in the energy industry, as well, including the production of lighter car batteries.